DNS is a critical component of the network. It is pervasive, touching all devices attached to the internet; nevertheless, the DNS infrastructure is treated as little more than the internet equivalent of a phone book. 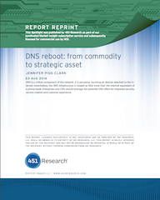 Enterprises and communication service providers (CSPs) should leverage the potential DNS offers for improved security, service creation and customer experience, and recognize that recursive DNS presents a significant opportunity. Desktop security/antivirus software cannot protect enterprises and consumers from the threats – such as bots, phishing, distributed denial-of-service (DDoS) attacks and unwanted content that today’s Internet brings.